In other words from the start to finish it was Orson Welles’ intention to turn this book into a film—faithfully transforming a work from one medium to another with as little alteration as possible. I had only known of this happening once before during this period and that was Huston’s THE MALTESE FALCON. Yet, even as faithful as that film version is to its source material, it still can’t compare to what Welles accomplished with AMBERSONS. Thus, the film version of THE MAGNIFICENT AMBERSONS is Booth Tarkington but—and this but is what makes all the difference—it is Tarkington filtered through the cinematic sensibilities of Orson Welles and in the process becomes an Orson Welles film. What Welles did change, and this is the all-important difference, was to alter the settings of scenes and their emotional impact. Conversations in the book that occur in a static bedroom setting, in the film are played out on the Amberson staircase as both the characters and camera are in motion. Scenes are improvised to enrich them. Welles combines two book scenes into one film scene so that the action is simultaneous; more complex thematically and far more interesting to watch. Dialogue is transposed from one character to another to both strengthen that character as well as to give them more complexity. Yet, there are entire scenes done in a single take. I don’t think until Max Orpheus in the late 40s, Preminger in the late 50s and 60s and Woody Allen today, have I been aware of a movie filmed with so many single take scenes. In the uncut version there are approximately 28 scenes done in a single or with an occasional seamless second angle compared to 11 multi-angle scenes. And many of those multi-angle scenes are composed of long individual takes. It is these kinds of choices that make a film a film and in this case an Orson Welles film. Let me conclude by stating that for anyone wanting to learn how to adapt a book into a screenplay, this script is the ultimate primer. All that need be done is read Tarkington and then study this script—comparing and then determining why certain choices were made. By doing that everything that need be learned will be learned. The magnificence of the Ambersons began in 1873. Their splendor lasted throughout all the years that saw their Midland town spread and darken into a city. A house on a period street with a white picket fence. On the sidewalk, two ladies dressed in silk and velvet are passing three ladies dressed in silk and velvet. They greet each other. …and everybody knew everybody else’s family horse-and-carriage. A mule appears on the opposite of the frame drawing the streetcar — an upper window of the house opens, a lady whistles, shuts the window and disappears as the driver pulls the mule to a stop. The passengers wait patiently -­ smoke, stroll around the car, chat or read their papers. The lady comes out of the house — a hat, cloak, umbrella and pocketbook added to her costume. She gets on the car, the passengers resume their seats, and the driver slaps the reins on the mule’s back. The only public conveyance was the street-car; A lady could whistle to it from an upstairs window and the car would halt at once and wait for her while she shut the window, put on her hat and coat, went downstairs, found an umbrella, told the “girl” what to have for dinner and came forth from the house. Too slow for us nowadays, because the faster we’re carried the less time we have to spare. But in those days they had time for everything! The house again — summer — night — a party in progress. Carriages drawn up before the picket fence. All the windows are bright and Japanese lanterns are strung up in the front yard. Gay young couples are strolling on the lawn. The same house — night. The house is dark. EUGENE MORGAN and JACK AMBERSON, both tipsy, and a group of five or six musicians carrying their instruments, enter and walk by the house. The CAMERA PANS with them as they pass a statue of Neptune and come to a lawn. They get set for the serenade, right in close to the camera. Eugene and Jack closest so their faces can be remembered when they again appear in the story. And even that prettiest of all vanished Customs – the serenade. On a summer night, young men would bring an orchestra under a pretty girl’s window – and flute, harp, fiddle, cello, cornet and base viol; would presently release their melodies to the dulcet stars. Eugene trips over the bass viol, falls on top of it and collapses, sinking through the top of as if it were a tub. CLOSE SHOT of a window on the second floor of the Amberson Mansion. ISABEL, looking hurt, closes the window. FULL SHOT of Wilbur Minafer rowing with Isabel in a boat. He wears a stove-pipe hat. CLOSE SHOT of Eugene, in his bedroom, observing himself in a mirror, as he puts on a derby hat with a bucket crown. …but next it would be a spoon. CLOSE SHOT of Eugene’s feet, in front of the mirror, one foot is part way in a high-topped boot, the other foot is unshod. His hands insert the bootjacks and pull the boot on. As he reaches out of the picture, presumably to get the boot for the other foot. SIMILAR SHOT of Eugene’s feet, shoeless. His hand returns with a shoe that has toes like the prow of a racing shell. He starts to put on the shoe. …and these were played through fashions that shaped them now with toes like box-ends and now with toes like the prows of racing shells. CLOSE SHOT of Eugene’s feet with shoes on. As he pulls a pair of trousers up over his legs, CAMERA PANS up and we see him in front of, and facing, a full-length mirror, looking at himself in a pair of un-creased trousers; the last hat we saw him try on and the shirt of a suit of long underwear. FULL SHOT of Eugene, his back to the mirror, his body facing camera, so that we see what he is inspecting as he looks over his shoulder at the reflection of his back in the mirror; a light-colored overcoat over his full dress, his black coattails hanging five inches below the overcoat. FULL SHOT of Eugene, observing himself in the mirror dressed for the afternoon in a suit which includes trousers like great bags. He has on a straw hat now and carries a bamboo stick. Satisfied with what he sees he starts out of the shot. …and he passed out of his tight trousers into trousers like great bags. Eugene comes out of his house wearing the same outfit as in previous scene. Outside his gate he turns and starts walking up the street. The people were thrifty in that Midland town because they were the sons or grandsons of the “early settlers,” who had opened the wilderness with wagons and axes and guns, but with no money at all. The pioneers were thrifty or they would have perished; they had to store away food for the winter, or goods to trade for food, and they often feared they had not stored enough. They left traces of that fear in their sons and grandsons. In the minds of most of these, indeed, their thrift was next to their religion. Eugene walks past a little area of trees. Now CAMERA PANS with him and shows that his destination is the magnificent Amberson Mansion, its splendor a severe contrast to the homes Eugene has just passed. Against so homespun a background the magnificence of the Ambersons was as conspicuous as a funeral. There it is! The Amberson Mansion! The pride of the town! Sixty thousand dollars for the wood work alone! Yes, sir — hot and cold running water upstairs and down, and stationary washstands in every last bedroom in the place! Well, Sir, I presume the President of the United States would be tickled to swap the White House for the new Amberson Mansion, if the Major’d give him the chance — but by the Almighty Dollar, you bet your sweet life the Major wouldn’t! Is Miss Amberson at home? No, suh, Mis’ Mo’ga’n –- Miss Ambuhson’s not at home. Eugene looks at him for a moment. He turns and starts away from the door. REVERSE ANGLE — HOLDING the three men in carriage. CUT IN corner of frame. We see the other arm of the signpost which says, “Amberson Boulevard,” and in background the little area of trees and the street up which Eugene has come. The men are looking up past CAMERA toward the mansion’s grounds. Look at that brick stable! New kinds of fancy rigs — and harness!–Everybody in town can tell when Amberson’s are out driving after dark, just by the jingle. Eugene enters from direction of the mansion. Eugene tips his hat and continues down the street away from camera. The men look at him. Wonder if she’s still mad at him. Eugene Morgan’s her best beau. Took a bit too much to drink last night and stepped right through the bass viol serenadin’ her. THE LITTLE AREA OF TREES AGAIN. Eugene enters again, on his way to the Mansion. He has on a different costume and this time a box of candy under his arm. CAMERA PANS with him to take in the Mansion. There is another group of people at the sign-post — two couples, citizens of the town, who have obviously been shopping and have met. Eugene does not notice them. They call it a Saint Bernard. So Fanny Minafer was bound to have one, too. And, by golly, she says the Ambersons bought theirs, and you can’t get one without payin’ money for it!– Honest! Eugene has reached the door, has rung the bell, and now the door is being opened by Sam. CLOSE SHOT of Eugene at the door. No, suh, Mis’ Ambuhson ain’t at home to you, Mist’ Mo’gan. REVERSE ANGLE on the two couples. They cost from fifty to a hundred dollars up! Old Alex wanted to know if I ever heard anybody wantin’ to buy a dog before. He saw some sense in payin’ somebody a dime, or even a quarter, to drown a dog for you, but to pay out fifty dollars or maybe more — well, sir, he like to choked himself to death. Eugene tips his hat as he passes, and goes down the street away from camera. Does seem pretty much like squanderin’ — yet, when you see that dog out walkin’ with Miss Isabel, he seems worth the money. I haven’t seen her since she got back from abroad. Well, sir, she’s not more’n just about seventeen or maybe eighteen years old — and I don’t know as I know just how to put it — but she’s — she’s kind of a delightful lookin’ young lady. A nickelodeon is heard playing inside. Isabel, with a St. Bernard dog on leash and Wilbur Minafer at her side, is coming out. They encounter Eugene. Eugene tips his hat. Isabel cuts him, Wilbur nods coolly and they cross him out of the scene, leaving Eugene looking after them sadly. One man is sitting in the chair being shaved and a couple of others are sitting on a bench under the racks holding the shaving mugs. Well, Wilbur may not be any Apollo, as it were, but he’s a steady young businessman. Two matrons, a seamstress, and Mrs. Foster in a corset and the involved underwear of the period. Looks like Isabel’s pretty sensible -– for such a showy girl. Wilbur Minafer! To think of her taking him, just because a man any woman would like a thousand times better was a little wild one night at a serenade! What she minds was his making a clown of himself in her own front yard! Made her think he didn’t care much about her. She’s probably mistaken, but it’s too late for her to think anything else now. The wedding’ll be a big Amberson­style thing, raw oysters floating in scooped-out blocks of ice and a band from out-of­town — And then Wilbur’ll take Isabel on the carefulest little wedding trip he can manage, and she’ll be a good wife to him, but they’ll have the worst spoiled lot of children this town will ever see. How on earth do you make that out, Mrs. Foster? She couldn’t love Wilbur, could she? Well, it’ll all go to her children, and she’ll ruin em! The same two matrons and Mrs. Foster are in CLOSEUP in the corner of the frame. In background is the church. As the scene starts, we see the backs of the matrons’ heads, for they are watching Isabel, holding a little boy by the arm walking up the steps of the church. Wilbur and Major Amberson are with her. Looks like Isabel isn’t going to have any more children. Yes, I guess there’s just going to be the one — but I’d like to know if he isn’t spoiled enough for a whole carload. A laborer is sieving sand. George, aged 9, gallops his white pony through the pile, enveloping the laborer. By golly, I guess you think you own this town! I will when I grow up. My grandpa owns it now, I guess you bet! Aw, pull down your vest! Don’t haf to! Doctor says it ain’t healthy! But I tell you what I’ll do; I’ll pull down my vest if you’ll wipe off your chin! With that he wheels the pony around, gallops back through the sand pile. There were people — grown people they were — who expressed themselves longingly: they did hope to live to see the day, they said, when that boy would get his come-upance! Something was bound to take him down, some day, and they only wanted to be there! SHOT of Georgie galloping along the street on his pony. George, aged ten, wearing long curls and a Fauntleroy suit, is approaching at a gallop on his white pony. Elijah, the Reverend’s nephew, is sitting on the gatepost. Look at the girly curly, Say bub, where’d you steal your· mother’s ole sash! Your sister stole it for me! She stole it off our clo’es line an’ gave it to me. You go get your hair cut! Yah! I haven’t got any sister! I know you haven’t at home. I mean the one that’s in jail. I dare ya to git down off’n that pony! As George jumps to the ground, Elijah descends from the gatepost — inside the gate. I dare ya outside that gate. George vaults the fence, catches Elijah who has started toward the house for shelter and starts pummeling him. The Reverend Smith rushes out of his house to intervene. A next door neighbor has also been attracted into her front yard by the noise. After a grotesque tussle -­ for George is hard, quick and remarkably tense in such matters — Reverend Smith separates the fighting boys and shakes George while Elijah dashes into the house. Here boy –- Boy! — That’ll be enough of that. You little -­ Ow! You stop that, you! I guess you don’t know who I am! Yes, I do know! And you’re a disgrace to your mother! You shut up about my mother! Isabel is reading a letter to George. Sam, the butler, is standing close by, his hand on the bridle of George’s pony. Georgie, you mustn’t say “liar.” Dear, did you say what he says you did? Lissen here, Mama; Grandpa wouldn’t wipe his shoe on that ole story teller, would he? I mean, none of the Ambersons wouldn’t have anything to do with him, would they? He doesn’t even know you, does he, Mama? That isn’t what we’re talking about. I bet — I bet if he wanted to see any of us, he’d haf to go ’round to the side door! Yes, we would, Mama! That kind of people, don’t see why you can’t say anything you want to, to ’em. You mustn’t say so. And you must promise me never to use those bad words again. EXTERIOR – DOWNTOWN STREET – AMBERSON BLOCK – DAY (1902) George, aged seventeen, is driving his dogcart at criminal speed down the street making pedestrians retreat from crossings and behaving as if he owns the earth. A hardware dealer, middle-aged, is forced to jump back on the sidewalk to avoid being run over. Got ‘ny sense! See here, bub, does your mother know you’re out? Turn down your pants, you would-be dude rainin! in dear ole Lunnon! Git off the earth! The dogcart turns a corner and halts in front of the Amberson Block — an old-fashioned four-story brick warren of offices. George ties his lathered trotter to a telegraph pole, looks at the building critically, goes in and climbs the worn stairs. George goes down the dark corridor to a door. Its upper half, of opaque glass, bears no sign to state the business or profession of the occupants within; but overhead, upon the lintel, the letters “F.O.T.A.” are smearingly inscribed, and above the lintel there is a drawing of a skull and crossbones. George raps three times; three raps similar to his sound from within. The door is opened by Charlie Johnson, a well-dressed boy of 16. George enters quickly and the door closes behind him. INTRTIOR – CLUB ROOM – AMBERSON BLOCK BUILDING – DAY. At one end of the room, beneath a damaged papier-mâché round shield with two battle-axes and two cross-hilted swards, is a little platform with a table on it. On the platform stands Fred Kinney holding, for a gavel, a Civil War horse-pistol. Facing him are seven boys of congenial age seated in a semicircular row of damaged office chairs. Welcome, Friend of the Ace. Look here, Charlie Johnson, what’s Fred Kinney doing in the president’s chair? Didn’t you all agree I was to be president just the same, even if I was away at school? Fred raps loudly for order. No it won’t. You put down that gavel. It belongs to my grandfather. I was legally elected here. All right. You’re president. Now we’ll hold another election. Who’s the founder of the F.O.T.A, if you please? Who got the janitor to let us have most of this furniture? You suppose you could keep this clubroom a minute if I told my grandfather I didn’t want it for a literary club anymore? I’d like to say a word on how you members been acting, too! If that’s what you want; you can have it. I was going to have a little celebration down here some night pretty soon, and bring some port wine, like we drink at school in our crowd there. Well, you got a new president now! I guess all I’better do is -­ resign! Fred Kinney begins a hot protest but it is immediately othered. Fred finds his hat and departs amid jeers. George steps upon the platform and takes up the horse-pistol. Old red-head Fred’ll be around next week. He’ll be around boot-lickin’ to get us to take him back in again· Well fellows, I suppose you want to hear from your president. I had a good time at the old school, back East, had a little trouble with the faculty and came home. But my family stood by me as well as I could ask. Now, I don’t suppose there’s any more business before the meeting. Anybody that’s game for a little quarter-limit poker or any limit they say, why I’d like to have ’em sit at the president’s card-table. He officially closes his speech by a pound on the table with the horse-pistol. The members start to re-arrange the semicircle of chairs for the card game. During the Narrator’s first lines, the scene has been DISSOLVING in to a FULL SHOT of the Amberson Mansion. We now see it clearly — its three floors brilliantly lighted for the gala affair which is in progress. Music is heard from within. Richly-dressed people are arriving in carriages, while crowds of the “uninvited” stand in the snow as close to the mansion entrance as possible, to watch. Remember you very well, indeed. George, you remember your Uncle John Minafer? During this, Eugene has started over the threshold and the DISSOLVE is completed. INTERIOR – RECEPTION HALL·AND STAIRCASE- AMBERSON MANSION – NIGHT (1904) REVERSE ANGLE – LONG SHOT Holding the door in far background as Eugene comes through. We see him for only a second for he is blocked out by people who cross between camera and the door. The hall and adjoining rooms are embowered in flowers. Music, supplied by a zither, harp, cello and fiddle is heard. (The orchestra is off to one side in a grove of palms.) Guests are talking and laughing above the music. Major Amberson, Isabel and George, now age nineteen, are receiving guests. Uncle John Minafer is shaking hands with the Major, who is looking a little askance at the “Sunday suit” of black broadcloth which Uncle John is wearing. Almost on top of George’s speech, Uncle John’s tremulous, strident voice cuts like the whine of a sawmill over the music and shouting for, being partly deaf, he hears his own voice only faintly — but he likes to hear it. Now don’t you look at me like that, Major! I never have worn an’ never will wear a swaller­tail coat. (turns to George and offers his hand) Georgie, you look fine – ha! Ha! — There wuz a time though durin’ your fourth month when you wuz so puny nobody thought you’d live. George, in a fury of blushes, drops the old man’s hand an turns to the next in line — somebody’s spinster aunt. Member you v’ry well ‘ndeed! CAMERA PANS a little, HOLDING Uncle John as he walks off into the crowd, his sawmill voice directed at nobody in particular. Eugene Morgan enters the scene and CAMERA PANS back with him as he comes up to Isabel. They look at each other. George regards Eugene sharply. At length Eugene looks at George. George is taking in Eugene’s unfashionable hair, his preoccupied tie and his old coat. Remember you very well ‘ndeed! George, you never saw me before in your life. But from now on you’re going to see a lot of me – I hope. I hope so, too, Eugene. You’ll find him in the game room with some of the others. He never was much for parties. Remember? Yes, I remember — I’ll come back for a dance. Eugene turns to the Major and offers his hand. CAMBRA PANS away from George to favor Eugene and the Major, and over their dialogue we hear George’s voice as he receives a family group. Of course, of course. Heard you’d come back to town. Is it true you’re going to settle down here? I plan to, Major – yes. Eugene sees Jack Amberson close by. CAMERA PANS slightly as Eugene and Jack meet and shake hands heartily, then walk away in the crowd. CAMERA NOW PANS back to George and Isabel. George is shaking hands with Lucy Morgan. Remember you very well, indeed! In the middle of his speech his tone suddenly becomes less formal and more gracious. He is visibly affected. George you don’t remember her either, though of course you will. Miss Morgan is from out of town. Lucy is making a big impression. You might take her up to the dancing. I think you’ve pretty well done your duty here. I didn’t catch his name when my mother presented him to me. You meam that queer-looking duck? Oh, I wouldn’t say that. The one with him’s Uncle Jack; Honorable Jack Amberson. I thought everybody knew him. He looks as though everybody ought to know him. (with sly intention) It seems to run in your family. Well, of course, I suppose most everybody does, out in this part of the country especially. Besides, Uncle George is in Congress; the family like to have someone there. George and Lucy continuing up the stairs. The music is loud and gay, and the guests are shouting over it. Uncle John is working his way through the crowd, his sawmill voice heard above all others. Solid black walnut every inch of it, balustrades and all. Sixty thousand dollars’ worth o’ carved woodwork in the house! Like Water! Spent money like water! Always did still do! Like water! Gosh knows where it all comes from! He sees Fanny close by. By this time they are close to Lucy and George. Misa Morgan — Miss Minafer. You must favor your mother, dear. I never knew her. George starts dancing with Lucy as Uncle John sweeps Aunt Fanny past them in wild, dervish-like prancings. They have just gotten out on the floor when the music stops. Give me the next one and the one after that, and give me every third one the rest of the evening. It sounds as though you were just telling me to give you all those dances. What about all-the other girls. It’s your duty to dance with? They’ll have to go without. (with vehemence) Here! I want to know: Are you going to give me those–? She laughs. Other male applicants flock around Lucy, urging contracts for what the remaining dances, but they can’t dislodge George from her side, though he makes it quite evident that they have managed to annoy him. Uncle John crosses the picture, with Aunt Fanny. D’want any more o’ that! Jus’ sliddin’ ‘round! Call that dancin’? Rather see a jig any day in the world! Wilbur Minafer joins him and relieves Fanny. During this George has pushed his way out of the cluster of boys, with Lucy. I’ll take Uncle John home. Wilbur walks away with Uncle John. They didn’t very modest, some of ’em. I don’t mind that, though. Not me! George walks Lucy to the hall. How’d those ducks get to know you so quick? Oh, I’ve been here a week. Looks as if you’d been pretty busy. Most of those ducks, I don’t know what my mother wanted to invite ’em here for. Oh, I used to see something of a few of ‘em. I was president of a club we had here and some of ’em belonged to it, but I don’t care much for that sort of thing any more. I really don t see why my mother invited ’em. Maybe she didn’t want to offend their fathers and mothers. I don’t think my mother need worry much about offending anybody in this old town. It must be wonderful. It must be wonderful. Mr. Amberson. Mr. Minafer, I mean. That isn’t “important.” Anybody that really is anybody ought to be able to do about as they like in their own town, I should think. By this time they are sitting on the stairway, and the music has been playing for a few minutes. They look off toward the dancers. SHOT on dance floor. Fanny and Eugene are dancing, rather gaily. Eugene sees Lucy and waves. Stairway — Lucy and George. Lucy, smiling returns the wave with a little gesture, but George stares stonily off. How’s that for bit of freshness. That queer-looking duck waving his hand at me like that. Oh, he did? Everybody seems to mean you! You certainly do seem to’ve been pretty busy this week you’ve been here! Lucy presses her bouquet of violets and lilies-of-the-valley to her face and laughs into it, not displeased. A short silence. The music stops and there is loud applause. The music starts again. See here! Are you engaged to anybody? You seem to know a good many people! Do you live in New York? We’ve lived all over. Papa used to live here in this town, before I was born. What do you keep moving around so for? Is he a promoter? Just lately, he’s been working on a new kind of horseless carriage. Well, I’m sorry for him. Horseless carriages! People aren’t going to spend their lives lying on their backs in the road and letting grease drip in their faces. Papa’d be so grateful if he could have your advice. I don’t know that I’ve done anything to be insulted for! You know, I don’t mind your being such a lofty person at all. I think it’s ever so interesting — but Papa’s great man! Is he? Well, let us hope so. I hope so, I’m sure. I’m just beginning to understand. What it means to be a real Amberson in this town. Papa told me something about it before we came, but I see he didn’t say half enough. Did your father say he knew the family before he left here? I don’t think he meant to boast of it. He spoke of it quite calmly. Girls are usual pretty fresh! They ought to go to a man’s college about a year! They’d get taught a few things about freshness! The music stops and there is the customary applause. Eugene, Isabel, Jack and Fanny are coming toward them. Lucy still has the flowers pressed to her face. Look here! Who sent you those flowers you keep makin’ such a fuss over? Oh, him? I s’pose he’s some old widower! Some old widower! Yes, he is a widower. I ought to have told you before; he’s my father. Eugene, Isabel, Jack and Fanny reach them. I’m here to claim my dance but I guess I won’t insist on it. George, dear, are you enjoying the party? They walk away, the older people watching them as they go. They look at her, not understanding. Those children. It’s touching. But of course they don’t know it’s touching. Oh, yes, Life’s got a special walloping for every mother’s son of ‘em! Maybe — maybe ‘some of the mothers can take the walloping for them. Not any more than she can take on her own face the lines that are bound to come on her son’s. I suppose you know that all these young faces have got to get lines on ’em? Maybe they won’t. Maybe times will change, and nobody will have to wear lines. Times have changed like that for only one person I know. What puts the lines on faces? Age or trouble? We can’t say that wisdom does it – we must be polite to Isabel. Age puts some, and trouble puts some, and work puts some, but the deepest wrinkles are carved by lack of faith. The serenest brow is the one that believes the most. Again Isabel looks at him inquiringly and again he laughs. Why, I believe — believe I do! Isabel! There’re times when you look exactly fourteen years old! During the preceding dialogue, they have started walking toward a punch bowl, and now they reach it, joining the Major and Wilbur. Jack hands a cup of punch to Isabel and then one to Eugene. I see you kept your promise, Eugene. Isabel, I remember the last drink Eugene ever had. Well, well, there’s another thing that’s changed; hardly anybody drinks nowadays. I had a pretty time with you that night, Jack, getting you upstairs. (laughs again) Fact is, I believe if Eugene hadn’t broken that bass fiddle and given himself away, Isabel never would have taken Wilbur. What do you think, Wilbur? I shouldn’t be surprised, if your notion’s right, I’m glad Gene broke the fiddle. What do you say about it, Isabel? By Jove! She’s blushing! The important thing is that Wilbur did get her, and not only got her but kept her! Eugene is as embarrassed as Isabel, but he laughs. There’s another important thing — that is, for me. It’s the only thing that makes me forgive that bass viol for getting in my way. George has retrieved Lucy, and now crosses with her in front of the group at the punch bowl, carrying plates of ice cream and cake. Do your ears burn, young lady? Everybody else’s name always is. I didn’t mean it was really funny. That’s just one of my crowd’s bits of horsing at college. Is “Lucy” a funny name, too? No. Lucy’s very much all right! Thanks about letting my name be Lucy. Two couples enter from the opposite direction, their hands occupied with plates heaped with food. As George and Lucy pass them, one of the men has to leap out of the way. He spills a little of the food. George and Lucy walk on. The CAMERA HOLDS on the two couples. Look at that! Look at that boy! (calls after George, not too loudly). Sorry, Your Highness! Eugene and Jack have come up behind them at the end of the man’s speech. They pass by, or through them, on their way to the buffet table, the CAMERA PULLING back in front of them. I can’t see why Isabel doesn’t see the truth about that boy! Too much Amberson, I guess, for one thing. And for another, his mother just fell down and worshipped him from the day he was born. I don’t have to tell you what Isabel Amberson is, Gene. She’s got a touch of the Amberson high stuff about her, but you can’t get anybody that ever knew her to deny that she’s just about the finest woman in the world. No you can’t get anybody to deny that. Well, she thinks he’s a little tin god on wheels. She actually sits and worships him! You can hear it in her voice when she speaks to him. You can see it in her eyes when she looks at him. My gosh! What does she see when she looks at him? She sees something that we don’t see. People come up behind them and reach for food. They crane their necks looking over their shoulders down at something on the table. Roger, come over here and look at the olives. Roger, aged 45, comes into the picture and looks vaguely toward the table. You’re supposed to eat ’em. Roger, interested, picks up an olive from beneath the camera and holds it up between thumb and forefinger, examining it. People move into scene around him to inspect the olive. Well, I reckon most everybody’11 be makin’ a stagger to worm through nine of ’em, now Amberson’s brought ‘em to town. Roger puts the olive back on the table and goes away with the man who nudged him, leaving one man who picks up the olive, looks around, and starts to eat it as he leaves. Eugene and Jack are alone. Look at him — my nephew Do you see an angel? No. All I see is a remarkably good looking fool-boy with the pride of Satan and a set of nice new drawing-room manners. Mothers are right. Mothers see the angel in us because the angel is there. You mean Georgie’s mother is always right. I’m afraid she always has been. She was wrong once, old fellow. At least, so it seemed to me. Wait till you know young Georgie a little better. Jack, if you were a painter, you’d paint mothers with angels’ eyes holding imps in their laps. Me, I’ll stick to the Old Masters and the cherubs. Somebody’s eyes’ must have been pretty angelic if they’ve been persuading you that Georgie Minafer is a cherub! They are. They’re more angelic than ever. Good-bye, I’ve got this dance with her. Eighteen years have passed but have they? Tell me, have you danced with poor old Fanny too, this evening? My gosh! (groans, half in earnest) Old times are starting all over again. Old times? Not a bit! There aren’t any old times. When times are gone, they’re not old, they’re dead! There aren’t any times but new times. CAMERA PANS with Eugene as he leaves Jack. He passes behind George and Lucy and continues on his way in the background while the CAMERA HOLDS on George and Lucy, PULLING BACK ahead of them as they walk. College — Lots o’useless guff! Then why don’t you study some useful guff? What do you mean: “useful”? Something you’d use later, in your business or profession? Just look at ’em. That’s a fine career for a man, isn’t it! Lawyers, bankers, politicians! What do they get out of life, I’d like to know. What do they ever know about real things? Where do they ever get? Lucy looks at him for a moment and then looks away to the ballroom. The dance floor, instead of being filled with people, now has only three or four dancers. The music is very sentimental. Eugene and Fanny are dancing. INTEERIOR – RECEPTION HALL – AMBERSON MANSION – NIGHT (1904) Members of the dance or orchestra — their coats on, and instrument cases and hats on the floor beside them -­ are standing in the middle of the ball, playing. Eugene and Isabel are dancing. Jack and Fanny are watching from one side; George and Lucy from another side near the stairway. Obviously the Morgans are the last guests to go, and Eugene has prevailed upon the musicians to play one final waltz. How lovely your motner is! She’s the gracefullest woman! She dances like a girl of sixteen. Most girls of sixteen are bum dancers. Anyhow, I wouldn’t dance with one unless I had to…The snow‘s fine for sleighing; I’ll come for you in a cutter at ten minutes after two. The music stops. Eugene and Isabel nod thanks to the musicians who pick up their cases, put their instruments away and leave. During this Eugene gets his overcoat and hat, and Lucy’s wrap. Lucy crosses to him, Jack joins George near the stairs, and for a moment they watch the others as they collect near the vestibule door, Eugene helping Lucy into her wrap. See here: just who is this fellow Morgan? Here’s a man with a pretty daughter, Georgie. You mean she used to be silly about him? She wasn’t considered singular. He was — he was popular. Do you take this same passionate interest in the parents of every girl you dance with? They are too close to the group to speak any more. There are final good nights. Eugene starts out the door, Jack following. Isabel and Fanny exit. I want to look at that horseless carriage of yours. If we’re going to ride in it tomorrow. I want to see if it’s safe. George holds open the door for Lucy. If you think I’m not in earnest you’re at liberty to make quite a big experiment! I don’t think I’ve often had so large a compliment as that; especially·on such short notice and yet, I don’t think I’ll go with you. You be ready at ten minutes after two. Yes, you will. Ten minutes after two. She goes through the door, George closes it. As George turns into the room from the door·, he sees Isabel standing in the center of the room, looking a little ·worried. George crosses to her. Well, old lady, what’s the matter? Isn’t everything all right? You’re going away so soon! Well, I’m coming back, don’t you suppose? Commencement’s only four months away. Is that all that worries you? I can never bear to see you go -­ that’s the most of it. They walk to the stairs and start up them, CAMERA FOLLOWING. And I’m a little bothered about your father, too. It seems to me he looks so badly. He isn’t much different from the way he’s looked all his life·, that I can see. Het s been worrying about some investments he made last year. I think his worry has affected his health. What investments? He isn’t going into Morgan’s automobile concern, is he? INTERIOR – SECOND FLOOR – AMBERSON MANSION – NIGHT (1904) Isabel and George enter, coming up stairs. They see Wilber, in bathrobe and dressing gown, who has come out of his bedroom. Isabel puts a restraining hand on George’s arm. Hello, dear — have you had trouble sleeping? Look here — how about this man Morgan and his old sewing-machine? Doesn’t he want to get Grandfather to put money into it? Isn’t that what he’s up to? During George’s speech, Fanny has come up the stairs and started for her bedroom. She stops. You little silly! What on earth are you talking about? Eugene Morgan’s perfectly able to finance his own inventions these days. I’ll bet he borrows money from Uncle Jack. Why do you say such a thing, George? He just strikes me as that sort of man. Isn’t he, Father? He was a fairly wild young fellow twenty years ago. (glancing at Isabel absently) He was like you in one thing, Georgie: he spent too much money — only he didn’t have any mother to get money out of a grandfather for him. But I believe he’s done fairly well of late years, and I doubt if he needs anybody else’s money to back his horseless carriage. Well, what’s he brought the old thing here for then? People that own elephants don’t take their elephants around with ‘em when they go visiting. What’s he got it here for? I’m sure I don’t know. You might ask him. Wilbur exits into his bedroom. I’ll be in to say good night. What in the world’s the matter with you? You’re his only sister, and yet you don’t know! He never wants to go anywhere that I ever heard of’. What is the matter with you? He doesn’t want to go because he doesn’t like this man Morgan. Good gracious Eugene Morgan isn’t in your father’s thoughts at all, one way or the other. Why should he be? Well — it strikes me — look here, what makes you and — and everybody — so excited over him? Excited! Can’t people be glad to see an old friend without silly children like you having to make a to-do about it? I’ve just been suggesting to your mother that she might give a little dinner for them. For whom, Georgie! For MR. Morgan and his daughter. Look here! Don’t do that! Mother mustn’t do that. It wouldn’t look well. Wouldn’t look well! See here, Georgie Minafer, I suggest that you just march straight on into your room! Sometimes you say things that show you have a pretty mean little mind! Why, what upsets this you this way? I know what you mean. You’re trying to insinuate that I’d get your mother to invite Eugene Morgan here on my account because he’s a widower! I’m trying to insinuate that you’re setting your cap at him and getting Mother to help you? Is that what you mean? You attend to your own affairs! She sweeps out, leaving him alone. George, dumbfounded looks after her. Well, I will be shot! I will — I certainly will be shot! Do you think George is terribly arrogant and domineering? Oh, he’s still only a boy. There’s plenty of fine stuff in him – can’t help but be, he’s Isabel Amberson’s son. You liked her pretty well once, I guess, Papa. I wonder just how she happened to marry Mr. Minafer. You know, I wish George wasn’t so conceited and bad-tempered. He –- he’s really quite nice. Maybe I shouldn’t call him exactly bad-tempered. Of course not. Only when he’s cross about something…You know, Lucy, you need only three things to explain all that’s good and bad about George. He’s Isabel’s only child. He’s an Amberson. He’s a boy. Well, Mr. Bones, of these three things, which are the good ones and which are the bad ones? Why don’t you like Eugene? Eugene Morgan? I like” him well enough — in his place. George stops unlacing abruptly and sits up. How do I feel about his daughter? Isabel, sti11 searching his face with her troubled gaze, seems not to have heard this last. George rises, goes to her and pats her reassuringly upon the shoulder. There, old lady, I won’t let him see it! It’s all right and you’d better toddle along to bed, because I want to undress. But, George — you say you don’t dislike him. Why don’t you like him? What is it that you don’t? There, there! It’s all right and you toddle along. Now, now. I really do want to get into bed. Good night, old lady. Good night, old lady. I’ll be polite enough to him, never fear — if we happen to be thrown together. So good night! I’m going to bed, old lady; so good night. Isabel kisses him and leaves. Isabel comes out of George’s room, closes the door and stands there for a moment, thoughtful. CLOSEUP of the runner of George’s cutter, as it snaps off. FULL SHOT of the cutter and horse as the little sleigh upsets and, after dragging Lucy and George several yards, leaves them lying together in a bank of snow. FULL SHOT of Eugene’s car, a short distance down the road. In the car are Isabel, Fanny and Jack, looking horrified toward the overturned sled. From beneath the car appears Eugene who has been working on it. Eugene starts running toward the sleigh as the others quickly start getting out of the car. SHOT at the overturned sleigh. The vigorous horse kicks himself free from the gear and gallops off. 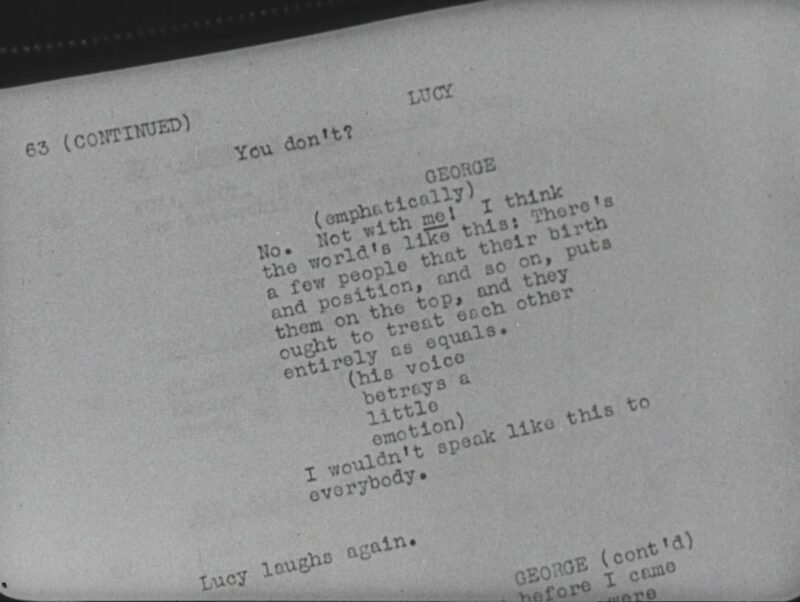 George and Lucy look at each other without speaking, flushed and breathing heavily. Suddenly George grabs Lucy and kisses her. She resists, but George prevails. Eugene rushes up and Lucy, catching his eye, pushes George away, terribly embarrassed. Eugene turns, grinning, to Isabel who is running toward them ahead of Jack and Fanny. They’re all right, Isabel! This snowbank’s a feather bed — nothing the matter with them at all. Isabel comes into the scene. No, no! You’ll catch cold; you mustn’t catch cold! Jack has brought Lucy’s hat. Aunt Fanny acts as lady’s maid, and as they all help to restore George and Lucy to their usual appearance, they begin to laugh — all but George. Oh, Pendennis’ll be home long before we will. All we’ve got to depend on is Gene Morgan’s broken–down chafing-dish yonder. They are moving toward the car. Eugene offers his hand to Isabel. Fanny gets in the rear seat, George helps Lucy climb in beside her and as he himself starts in after Lucy, Isabel sees that his light patent leather shoes have snow clinging to them. She rushes to him, taking out a lace handkerchief, and begins to wipe the snow off the foot he has placed on the iron step, to mount. Then stamp the snow off. You mustn’t ride with wet feet. They’re not wet! For goodness’ sake get in! You’re standing in the snow yourself. Get in! Isabel turns to Eugene, who is watching her apprehensively. He helps her in, climbs in after her. You’re the same Isabel I used to know! You’re a divinely ridiculous woman. He gets in beside her. Jack has climbed aboard from the other side. Am I, Eugene? “Divinely” and “ridiculous” just counterbalance each other, don’t they? Plus one and minus one equal nothing; so you mean I’m nothing in particular? No, that doesn’t seem to be precisely what I mean. The car plunges forward, then rolls on noisily. Look! We’re going! It must be another accident. She breathes, she stirs; she seems to feel a thrill of life along her keel! Group in car. Eugene starts to sing THE MAN WHO BROKE THE BANK AT MONTE CARLO. Jack joins him lustily. Your father wanted to prove his horseless carriage would run, even in the snow. It really does too. You tried to swing underneath me and break the fall for me when we went over. I knew you were doing that, and — it was nice of you. Wasn’t any fall to speak. (quietly) How about that kiss? When we get this far out-you can see there’s quite a little smoke hanging over town. Yes, and as it grows bigger, it seems to get ashamed of itself so it makes that cloud and hides in it. You know, Isabel, I think it used to be nicer. I know what you mean, Eugene. It’s because we were young. Maybe — It always used to be sunshiny, and the air wasn’t like the air anywhere else. As I remember it, there always seemed to be gold dust in the air. How about it, young folks? Notice any gold dust? I wonder if we really do enjoy it as much as we’ll look back and think we did? I feel as if I must be missing something about it, somehow, because I don’t ever seem to be thinking about what’s happening at the present moment. I’m always looking forward to something -– thinking about things that will happen when I’m older. You’re a funny girl, but your voice sounds pretty nice when you think and talk along together like that! Eugene bursts into song again, joined by Jack, and finally Isabel. They are driving by a section of the Amberson Estate. He points to a statue, a cast-iron sculpture, which has a blackish streak from Minerva’s forehead to her nose-tip, and a few more streaks upon the folds of her drapery. Somebody ought to see that these statues are kept clean. My grandfather owns a good many of these houses, I guess, for renting Of course, he sold most of the lots — but he ought to keep things up better. It’s getting all too much built up. He lets these people take too many liberties: they do anything they want to. Lucy lifts her muff to her face and laughs into it. What are you laughing at now? You’ve got that way of seeming quietly superior to everybody else. I don’t believe in that kind of thing. No. Not with me! I think the world’s like this: There’s a few people that their birth and position, and so on, puts them on the top, and they ought to treat each other entirely as equals. (his voice betrays a little emotion) I wouldn’t speak like this to everybody. I had a notion before I came for you today that we were going to quarrel. No, we won’t. It takes two! She starts to sing with the others. FULL SHOT. A number of funeral carriages, and at least one automobile, are drawn up in the foreground. CLOSE SHOT at the door to which a crepe is fastened. Eugene is in the foreground. Over his shoulder we see the door open. He starts across the threshold. LONG SHOT, HOLDING Eugene coming through the door in the distance. He is blocked from view for a moment by a person in mourning who crosses through the scene close to camera. When we see Eugene again, he is walking across the hall in the background. CAMERA PANS to HOLD him. Another person enters close to camera; he looks down sadly as he goes by and we see that, in panning, the camera has picked up the edge of a coffin which now forms the bottom of the frame. When the foreground is clear, we see Eugene has stopped to talk with the Major and Jack, but they are far away and what they say is not heard. Mrs. Foster, Mrs. Johnson, Uncle John Minafer, Lucy and others pass by the coffin, during which time Eugene comes forward — seen for short moments when the foreground is clear. Eugene walks by the coffin, CAMERA PANS to HOLD on him as he passes Fanny to join Isabel and George by the window. Fanny is in a chair, her face swollen and terribly drawn from excessive weeping, and when Eugene passes her, she looks up at him and turns her head slowly, following him with her eyes. REVERSE – CLOSE SHOT on Fanny. Her back is to camera, but her head is turned toward it as she watches Eugene over her shoulder. The tears, which had been checked before she saw Eugene, now begin to course down her cheeks. This is a scene of stone only — not a tree or shrub in sight. In the background a white marble column, taller than any other in the neighborhood, with the name “AMBERSON” carved on it. In the foreground a granite block with the name “MINAFER” chiseled upon its one polished side. In the intervening space, headstones marking the graves of Amberson and Minafer families. Close to camera is Wilbur’s grave with a new headstone bearing his name and date of birth and death, and heaped high with flower tributes. The same scene. Months later, after a rainfall. The headstones are wet and the graves surrounded by puddles reflecting the sky. Some of the dirt has been washed off of Wilbur’s grave, and on it is only a small bouquet. INTERIOR – KITCHEN: AMBERSON MANSION – NIGHT – (RAIN) – (1905) George, in mourning, is seated at the table, eating hungrily. His wet overcoat, hat and an umbrella are near the stove, drying out. A few pieces of luggage nearby. Fanny, also in mourning, enters with more food. Where did Isabel go to? It never was becoming to her to look pale. What’d you say, Aunt Fanny? Nothing. I suppose your mother’s been pretty gay at the Commencement? Going out a lot? How could she? In morning, of course all she could do was just sit around and look on. That’s all Lucy could for that matter. I suppose so. How did Lucy get home? Why, on the train with the rest of us. I mean from the station. Did you drive out to their house with her before you came here? No. She drove home with her father, of course. Oh, I see. So Eugene came to the station to meet you. To meet us? How could he? I don’t know what you mean. I haven’t seen him while your mother’s been away. Well, naturally, since he made the trip home with us! He did? He’s been with you all the time? No; only on the train and the last three days before we left. Uncle Jack got him to come. Her eyelids droop and she is silent. George rises. Your mother’s not mentioning that Mr. Morgan had been with you. Didn’t think of it, I suppose. Jack comes in the door behind Fanny. George stops him with a wink. I’ll tell you something, in confidence. Well, it struck me that Mr. Morgan was looking pretty absent-minded most of the time; and he certainly is dressing better than he used to. He isn’t dressing better. He’s dressing up! Fanny you ought to be a little encouraging when a prize bachelor begins to show by his haberdashery what he wants you to think about him. Uncle Jack tells me the automobile factory’s been doing quite well — won a race, too! Honestly, Aunt Fanny, I shouldn’t be a bit surprised to have him request an interview with me any day and declare that his intentions are honorable, and ask my permission to pay his addresses to you. What had I better tell him? I didn’t know you’d got so sensitive as all that. Fanny rushes out of the room. A moment’s silence. Jack sighs, lights a cigar. You just can’t joke with her about anything anymore. It all began when we found out father’s business was washed up and he didn’t leave anything. I think maybe we’ve been teasing her about the wrong things. Fanny hasn’t got much in her life. You know, Georgie, just being an aunt isn’t really the great career it may sometimes seem to be. I really don’t know of anything much Fanny has got except her feeling about Eugene. George has moved to a window and is looking out. He rushes out of the room. But George is gone. Jack picks up the umbrella and follows him. EXTERIOR – Amberson Mansion – LAWN AND EXCAVATIONS – NIGHT – (RAIN) – (1905) The sweep of lawn has been made unsightly by excavations for the cellars of five new houses, each within a few feet of its neighbor. Foundations of brick are already laid; everywhere are mud puddles, drenched piles of brick, stacked lumber, sand heaps, and mortar beds. George rushes in from the house and stops, oblivious of the rain. Jack joins him a moment later, and holds the umbrella over the two of them. Just what does Grandfather mean by this? My private opinion is he wants to increase his income by building these houses to rent. Well, can’t he increase his income any other way but this? It would appear he couldn’t — your mother said not to tell you till we got home, so as not to spoil commencement. She was afraid you’d be upset. Upset! I should think I would be upset! He’s in his second childhood. What did you let him do it for? Well, I thought, myself, it was a mistake. I wanted him to put up an apartment building instead of these houses. An apartment house! Oh my gosh! Don 1t worry! Your grandfather wouldn’t listen to me, but he’ll wish he had, some day. Is he getting miserly in his old age? Do you think so, Georgie? I don’t mean he’s a miser, of course. He’s liberal enough with mother and me; but why, on earth, didn’t he sell something or other rather than do a thing like this? I believe ho has sold something or other, from time to time. Well, in heaven’s name, what did he do it for? To get money. That’s my deduction. I suppose you’re joking — or trying to! Over the entrance is a sign reading: “MORGAN HORSELESS CARRIAGES.” Parked in front are Eugene’s car and George’s runabout. The vehicles are empty. George, Isabel and Fanny are being escorted through Eugene’s factory by Lucy and Eugene. The noise of machinery is great and we can tell more by their pantomime than by what we hear that Lucy is going through involved explanations about the machinery in answer to Isabel’s eager questions. Eugene looks on and laughs at Lucy’s mistakes. Isabel offers everything pleased exclamations. George is bored, and Fanny bleak. They have been slowly walking toward CAMERA from the background, pausing occasionally for Lucy’s explanation of some special feature. And were now turning out a car and a quarter a day. All this noise and smell seems to be good for you. You ought to come here every time you get the blues. Oh, she doesn’t get the blues, George. I never knew a person of a more even disposition. I wish I could be like that! No — What makes me laugh so much at nothing is this place. Wouldn’t anybody be delighted to see an old friend take an idea out of the air like that -­ an idea most people laughed at him for – wouldn’t any old friend of his be happy to see how he’d made his idea into such a splendid, humming thing as this factory — It makes us all happy! Eugene! She stretches her hand out to him. He takes it quickly, giving her a look in which his laughter tries to remain but vanishes before a gratitude threatening to become emotional. Give him your hand, Fanny. There! If Brother Jack wore here, Eugene would have his three oldest and best friends congratulating him all at once. We know what Brother Jack thinks about it, though. It’s just beautiful, Eugene! Did you ever see anything so lovely? As your mother! Think of her doing that! She’s a darling! And Papa (imperfectly repressing a tendency to laugh) Papa looks as if he were either going to explode or utter loud sobs! George and Lucy come out and get into George’s runabout. People that age are always sentimental. They get sentimental over anything at all. George and Lucy in the runabout. They hear a siren, and before the sound dies away, Eugene’s car, with Isabel and Fanny in it, comes from behind and passes them. I’ll still take a horse, any day. He checks Pendennis to a walk. Why? Do you want him to trot his legs off? I know when you make him walk it’s so you can give all your attention to — to proposing to me again! George, do let Pendennis trot again! Get up, Pendem1is! Trot Go on! Commence! Pendennis pays no attention and George laughs fondly. You are the prettiest thing in this-world, Lucy! When are you going to say were really engaged? Oh, not for years. So, there’s the answer. Lucy! Dear, what’s the matter? You look as if you were going to cry. (plaintively) You always do that whenever I can get you to talk about marrying me. One reason’s because I have a feeling that it’s never going to be. Don’t you care enough about me to marry me? Won’t you always care that much about me? I’m — yes George. I’m afraid so, George. I never do change anything. Well, then, why in the world won’t you drop the “almost”? Everything is so — so unsettled. If you aren’t the queerest girl! What is “unsettled”? Well, for one thing, you haven’t settled on anything to do. At least if you have, you’ve never spoken of it. She gives him a quick side glance of hopeful scrutiny; then looks away, not happily. George permits a significant period of silence to elapse before making any response. Lucy, haven’t you perfectly well understood that I don’t mean to go into business or adopt a profession? I wasn’t quite sure. I really didn’t know — quite. But what are you going to do George? I expect to live an honorable life. I expect to contribute my share to charities, and to take part in — in movements. I should like to revert to the questions I was asking you, if you don’t mind. Het s a mechanical genius. Of course he’s both — and he’s done all sorts of things. Very well. I merely wish to ask if it’s his influence that makes you think I ought to “do” something. (his face darkening with resentment) It’s your father’s idea, isn’t it, that I ought to go into business and that you oughtn’t to be engaged to me until I do? No! I’ve never once spoken to about it Never! But you know without talking to him that it’s the way he does feel about it? Do you think I’d be much of a man if I let any other man dictate to me my own way of life? I don’t believe in the whole world scrubbing dishes and selling potatoes and trying law cases. No, I dare say I don’t care for your father’s ideals any more than he does for mine! Giddap, Pendennis! Pendennis quickens eagerly to a trot. They pass the Major’s sleazy old buggy going the other way. INTERIOR – MAJOR AMBERSON’S BUGGY – DAY – (PROCESS) – (1905) Major Amberson and Jack are inside. He seems to have recovered. Looks in the highest good spirits. Your grandson. Last night he seemed inclined to melancholy. What about? Not getting remorseful about all the money he’s spent at college, was he? I wonder what he thinks I’m made of. Gold. (gently) And he’s right about that part of you, Father. Never mind, Father. Don’t think of it. When things are a nuisance, it’s a good idea not to keep remembering ‘em. I try not to. I try to keep remembering that I won’t be remembering anything very long. (becomes mirthful and slaps his knee) Not so very long now, my boy. Not so very long now. Not so very long! EXTERIOR – VERANDAH – AMBERSON MANSION – EVENING – (1905) George is sitting with Isabel and Fanny on the verandah. He sits on the copestone of the parapet, his back against the stone pilaster; his attitude not comfortable, but rigid, and his silence not comfortable either, but heavy. However, to the eyes of his mother and his aunt, who occupy wicker chairs at a little distance, he is almost indistinguishable except for the stiff, white shield of his evening frontage. The five new houses on the lawn have progressed some in construction; one is already completed. In the street flash the lights of silent bicycles riding by in pairs and trios, striking their bells, the riders’ voices calling and laughing. Surreys rumble lightly by, and frequently there is a glitter of whizzing spokes from a runabout or sporting buggy. Interspersed, disrupting the peace of the night, comes an occasional racketing auto — causing bicycles and people to scatter to cover. It’s so nice of you always to dress in the evening, George. Your Uncle Jack always used to, and so did Father, for years; but they both stopped quite a long time ago. It seems to me we don’t see it done any more, except on the stage and in the magazines. Isabel accepts his silence as acquiescence and turns her head to gaze thoughtfully out at the street. I don’t believe we’11 see as many of those automobiles next summer. I’ve begun to agree with George about their being more of a fad than anything else. Like roller skates. Besides, people just won’t stand for them after a while. I shouldn’t be surprised to see a law passed forbidding the sale of automobiles the way there is with concealed weapons. Fanny! You’re not in earnest? Then you didn’t mean it when you told Eugene you’d enjoyed the drive this afternoon? I didn’t say it so very enthusiastically, did I? Perhaps not, but he certainly thought he’d pleased you. I don’t think I gave him any right to think he’d pleased me. I hardly think I’d want anyone to get the notion he’d pleased me just now. It hardly seems time yet — to me. Silence except for the creaking of the rocking chair; then a low musical whistle is heard, softly rendering an old air from “Fra Diovolo.” The creaking stops. Whistling “On Yonder Rock Reclining”? Not at all. I had an idea George was depressed about something; and I just wondered if he could be making such a cheerful sound. You didn’t eat a very hearty dinner, but I thought it was probably because of the warm weather. Are you troubled about anything? That’s good. I thought we had such a nice day, didn’t you? Satisfied, Isabel leans back in her chair. After a time she rises, goes to the steps and stands for several minutes looking across the street. Then her laughter is faintly heard. Are you laughing about something? I asked: were you laughing at something? REVERSE ANGLE – SHOOTING past Fanny, Isabel and George on the veranda, toward Mrs. Johnson’s house beyond the passing traffic in the street. One of the windows is lighted and Mrs. Johnson’s form can be discerned silhouetted in the window frame. It’s the funny that old Mrs. Johnson. She has a habit of sitting at her bedroom window with a pair of opera glasses. Really. You can see the window through the place that was left when we had the dead walnut tree cut down. She looks up and down the street, but mostly over here. Sometimes she forgets to put out the light in her room, and there she is, spying for all the world to see. I’ve always thought her a very good woman. So she is, and if her poor old opera glasses afford her the quiet happiness of knowing what sort of young man our new cook is walking out with, I’m the last to begrudge it to her! Don’t you want to come and look at her, George? What? I beg your pardon. I hadn’t noticed what you were talking about. Isabel exits into the house. Fanny stops rocking, leans forward, drawing her black gauze wrap around her shoulders. She shivers. Isn’t it queer, how your mother can use such words? What words are you talking about? Seems to me you’re using them yourself. Oh! You mean when I repeated what she said? That’s hardly the same thing, George. I don’t think you’ll convince anybody that mother’s unfeeling. I’m not trying to convince anybody. I mean merely that in my opinion — well, perhaps it may be just as wise for me to keep my opinions to myself. She pauses expectantly, anticipating that George will urge her to reveal her opinion. But George is too occupied with himself. Fanny, disappointed, rises to leave. She halts with her hand on the latch of the screen door. There is one thing I hope. I hope at least she won’t leave off her full mourning on the very anniversary of Wilbur’s death! The door clangs shut behind her, and the sound annoys George. He sits by himself on the steps — worrying. Now Lucy appears in old-fashioned transparency (the shadowy ghost figure from the silents). She throws herself on the steps at his feet. George, you must forgive me! Papa was utterly wrong! I have told him so, and the truth is that I have come rather to dislike him as you do, and as you always have, in your heart of hearts. Lucy, are you sure you understand me? You say you understand me, but are you sure? Oh, so sure! I will never listen to Father’s opinions again. I do not even care if I never see him again! This softened mood lasts until he realizes that it has been brought about by processes strikingly lacking in substance. Abruptly he swings his feet down from the copestone to the floor of the verandah. Then George pictures Lucy as she probably really is at this moment: sitting on her own front porch in the moonlight with four or five boys, all of them laughing most likely, and some idiot probably playing a guitar. George, still harassed by his thoughts, begins furiously to pace the stone floor. Riffraff! (again and again) Riffraff! Riffraff! EXTERIOR – GRAPE ARBOR – AMBERSON MANSION – LATE AFTERNOON – (1905) Isabel and Eugene are sitting together in the arbor. Silence between them. I mean the things we have that we think are so solid — they’re like smoke, and time is like the sky that the smoke disappears into. You know how a wreath of smoke goes up from a chimney, and seems all thick and black and busy against the sky, as if it were going to do such important things and last forever, and you see it getting thinner and thinner — and then, in such a little while, it isn’t there at all; nothing is left but the sky, and the sky keeps on being just the same forever. Don’t you think you should tell George? He should hear it from you. INTERIOR – DINING ROOM – AMB RSON MANSION – DAY – (1905) The whole family is present, and Eugene is a guest. They are just finishing their dessert. We all do. Lucy’s on a visit, Father. She’s spending a week with a school friend. George, how does it happen you didn’t tell us before? He never said a word to us about Lucy’s going away. Probably afraid to. Didn’t know but he might break down and cry if he tried to speak of it! Isn’t that it, Georgie? The Major’s chuckle develops into laughter at George’s silence and embarrassment. Or didn’t Lucy tell you she was going? At any rate, Georgie didn’t approve. I suppose you two aren’t speaking again? Jack is nice enough to change the subject. Eugene I hear somebody’s opened up another horseless carriage shop somewhere out in the suburbs. I suppose they’ll either drive you out of the business, or else the two of you’ll drive all the rest of us off the streets. Well, we’ll even things up by making the streets bigger. It isn’t the distance from the center of a town that counts, it’s the time it takes to get there. This town’s already spreading; automobiles are going to carry city streets clear out to the county line. I hope you’re wrong, because if people go to moving that far, real estate values here in the old residence part of town are going to be stretched pretty thin. So your automobiles are going to ruin all your old friends, Eugene. Do you really think they’re going to change the face of the land? Automobiles are a useless nuisance. What did you say, George? I said automobiles were a nuisance. They’ll never amount to anything but a nuisance. They had no business to be invented. Of course, you forget that Mr. Morgan makes them, and also did his share in inventing them. If you weren’t so thoughtless he might think you rather offensive. I don’t think I could survive it. I’m not sure George is wrong about automobiles. With all their speed forward they may be a step backward in civilization. It may be that they won’t add to the beauty of the world, nor to the life of men’s souls. I am not sure. But automobiles have come, and almost all outward things are going to be different because of what they bring. They’re going to alter war, and they’re going to alter peace. I think men’s minds are going to be changed in subtle ways because of automobiles. And it may be that George is right. It may be that ten or twenty years from now, if we can see the inward change in men by that time, I shouldn’t be able to defend the gasoline engine, but would have to agree with him that automobiles “had no business to be invented” (looks at his watch) Well, Major, I hope you’ll excuse me — and Isabel — I’ve got to get down to the shop and talk to the foreman. I’ll see you to the door. Don’t bother, sir, I know the way. George, dear, what did you mean? Takes one of the Major’s cigars. I don’t see why he should be. I didn’t say anything about him. He didn’t seem to me to be hurt — seemed perfectly cheerful. What made you think he was hurt? By Jove, Georgie, you’re a puzzle! In what way, may I ask? It’s a new style of courting a pretty girl, I must say, for a young fellow to go deliberately out of his way to try and make an enemy of her father by attacking his business! By Jove! That’s a new way of winning a woman. George slams out of the dining room. INTERIOR – STAIRCASE AND GEORGE’S BEDROOM – AMBERSON MANSION – DAY – (1905) Fanny goes up to George, and they play the following scene going up the stairs to George’s bedroom. George, you struck just the right treatment to adopt. You’re doing just the right thing! Now, what on earth do you want? Your father would thank you if he could see what you’re doing. You make me dizzy! Quit the mysterious detective business! You don’t care to hear that I approve of what you’re doing? She breaks down into silent weeping. Oh, for Gosh sakes! What in the world’s wrong with you? You’re always picking on me. Always — ever since you were a little boy! You wouldn’t treat anybody in the world like this except old Fanny! “Old Fanny” you say. “It’s nobody but old Fanny, so I’ll kick her — nobody’ll resent it. I’ll kick her all I want to!” And you’re right; I haven’t got anything in the world, since my brother died – nobody nothing! Somebody else told me what? I’d found what out for myself? How people are talking about your mother. Look here. Look here, I’d like (greatly agitated) Just what do you mean? I only wanted to say that I’m sorry for you, George, that’s all — But it’s only old Fanny, so whatever she says — even when it’s sympathy — pick on her for it! Hammer her! (sobs) Hammer her! It’s only poor old lonely Fanny! You look here! Uncle Jack said if there was any gossip it was about you! He said people might be laughing about the way you ran after Morgan, but that was all. Yes; it’s always Fanny! Ridiculous old Fanny – always — always! You told me there wasn’t any talk. I didn’t think there was much, then. I didn’t know how much there was. You told me Mother never saw him except when she was chaperoning you. Everybody knows it. Everybody in this town knows that Isabel never really cared for any other man in her life. !Poor Wilbur! He was the only soul alive that didn’t know it! I believe I’m going crazy. You mean you lied when you told me there wasn’t any talk? It wouldn’t have amounted to anything if Wilbur had lived. You mean Morgan might have married you? No. Because I don’t know that I’d have accepted him. I certainly didn’t care enough about him to marry him; I wouldn’t have let myself care that much until he showed that he wished to marry me. I’m not that sort of person! What I mean is if Wilbur hadn’t died, people wouldn’t have had it proved before their very eyes that what they’d been talking about was true! You say — you say that people believe — they believe my mother is — is in love with that man? And because he comes here and they see her with him driving — and all that — they think they were right when they said she was in — in love with him before – before my father died? Why, George, don’t you know that’s what they say? You must know that everybody in town thinks they’re going to be married very soon. George is on the verge of nausea from shock. Who told you there was talk? Where is this talk? Where does it come from? Who does it? Why, I suppose pretty much everybody. I know it must be pretty general. How did you get hold of it? I hardly think it would be fair to give names. Look here. One of your most intimate friends is that mother of Charlie Johnson’s. Has she ever mentioned this to you? You and she have talked about it! George starts toward the door. What are you going to do, George? But George leaves. Fanny stares after him, terrified at what she has done. George strides through the gate, up to the house. The front doorbell is ringing insistently. Mrs. Johnson hurries to it and opens the door, admitting George. MR Amberson — I mean Mr. Minafer. I’m really delighted. Mrs. Johnson, I’ve come to ask you a few questions. I don’t mean to waste any time, Mrs. Johnson. You were talking about a — you were discussing a scandal that involved my mother’s name. My aunt told me you repeated this scandal to her. Don’t tell me what you intend, please. And I’d prefer it if you wouldn’t make your voice quite so loud in this house, which I happen to own. I had a perfect right to discuss the subject with your aunt. Other people may be less considerate. Other people! That’s what I want to know about — these other people! How many? I want to know how many other people talk about it. Really, this isn’t a courtroom and I’m not a defendant in a libel suit. You’ll know something pretty quick! You’ll know that you’re out in the street. Please to leave my house! George stiffens sharply – bows and strides out the door. INTERIOR – JACK ‘S BATHROOM – AMBERSON MANSION – NIGHT – (MOONLIGHT) – (1905) Jack and George. Jack is in the tub. Oh, now you have done it! What have I done that wasn’t honorable and right? Do you think these riffraff can go around bandying my mother’s good name? What do you suppose I’ll be doing? I’m going to stop this thing if I have to force my way into every house on National Avenue and Amberson Boulevard! Georgie, gossip’s never fatal till it’s denied. Nobody has a good name in a bad mouth! Nobody has a good name in a silly mouth, either. Didn’t you understand me when I told you people are saying my mother means to marry this man? If such a — such an unspeakable marriage did take place do you think that would make people believe-they’d been wrong in saying — you know what they say. Great gosh! You speak of it so calmly! Well, why shouldn’t they marry if they want to? It’s their own affair. Why shouldn’t they? Why shouldn’t they? Yes. Why shouldn’t they? I don’t see anything precisely monstrous about two people getting married when they’re both free and care about each other. What’s the matter with their marrying? It would be monstrous! Monstrous even if this horrible thing hadn’t happened, but now in the face of this — oh, you can sit there and even speak of it! Your own sister! For Heaven’s sake, don’t be so theatrical! (seeing that George is leaving the room) Come back here. You mustn’t speak to your mother of this. George stops and looks at him. I don’t think she’s very well. Mother? I never saw a healthier person in my life. She doesn’t let anybody know but she goes to the doctor regularly. Women are always going to doctors regula11y. I’d leave her alone, George. INTERIOR – SECOND FLOOR HALL – AMBERSON MANSION – MOONLIGHT – (1905) George comes out of Jack’s room and starts toward his own. As he nears it, the door of Isabel’s room opens. George steps into shadow and does not answer. Isabel crosses to his door, opens it and looks in. The light has been left burning. Seeing George is not in his room, she returns to her own. George noiselessly goes to the stairs and exits up them to the ballroom. INTERIOR – STAIRCASE AND BALLROOM – AMBERSON MANSION – MOONLIGHT – (1905) Moonlight, coming through the glass ceiling, floods the room. George walks to the center of the ballroom and stands there, reflected in the pier glass mirrors that line all sides of the room. Then he hears a quick footfall, and Isabel’s voice again. Georgie — is that you? Isabel is heard coming up the stairs. George has nowhere to retreat, so he just stands there. Isabel stops on the stairs, seeing his lonely figure standing in the ballroom. I’ve been wondering where you were, dear. Wherever it was, I hope you had a pleasant evening. You wouldn’t care to be kissed good night, I suppose? (with a little flurry of placative laughter) At your age, of course! Silence, blanker than those which had preceded. She goes down the stairs. George enters, unwraps a framed photograph of Wilbur, places it on a table, and stands looking at it. Poor, poor father! Poor man, I’m glad you didn’t know! He walks to the drawing room. INTERIOR. DRAWING ROOM – AMBERSON MANSION – DAY-(1905) George goes to a front window and sits looking through the curtains. The house is quiet. Then a ripple of song by Isabel is heard. The words become indistinct; the air is hummed absently, the humming shifts to a whistle, then drifts out of hearing, and the place is still again. George looks out the window. ANGLE past George peering through the drawing room window curtain, toward the street. An automobile stops, and Eugene jumps lightly down from it. The car is of a new pattern, low and long, with an ample seat in the tonneau; a professional driver sits at the wheel, goggled out of all personality. Eugene is richly dressed in the new outdoor mode: his motoring coat is soft gray fur; his cap and gloves of gray suede. He looks like a millionaire as he comes happily up the path. George leaves the window. The doorbell rings. George enters and waits at the entrance of the reception room until Mary comes through on her way to answer it. You needn’t mind, Mary. I’ll see who it is and what they want. Probably it’s only a peddler. George goes slowly to the front door and halts, regarding the misty silhouette of Eugene upon the ornamental frosted glass. After a minute of waiting, Eugene’s arm can be distinguished outstretched toward the bell — to ring a second time. But before the gesture is completed, George abruptly throws open the door and steps squarely upon the middle of the threshold. A slight change shadows the face of Eugene; happy anticipation gives way to something formal and polite. How do you do, George? Mrs. Minafer expects to go driving with me, I believe — if you’ll be so kind as to send her word that I’m here. I heard you. You said you had an engagement with my mother, and I told you, No! Eugene gives him a steady look. What’s the — the difficulty? My mother will have no interest in knowing that you came here today. Or any other day! Eugene continues to look at him with a scrutiny in which begins to gleam a profound anger. I’m afraid I don’t understand you. I doubt if I could make it much plainer, but I’ll try. You’re not wanted in this house, Mr. Morgan, now or at any other time. Perhaps you’ll understand — this! He slams the door in Eugene’s face. Then, not moving away, he stands just inside the door and notes that the misty silhouette remains upon the frosted glass for severa1 moments; the silhouette disappears. George exits toward the drawing room. MEDIUM LONG SHOT past Eugene’s car toward mansion doorway. Eugene, in baffled retreat, walks slowly down the steps and comes down the path to his car. REVERSE ANGLE through drawing room window — over George’ shoulder as he watches Eugene get into his car slowly, not looking back at the house. Observing the heaviness of his movements, George indulges in a sickish throat rumble which bears a cousinship to mirth. When the car has left George leaves the window. George again seats himself beside the table where on it he has placed the photograph of his father, he picks up a book and pretends to read it. Isabel, still whistling “Lord Bateman,” comes into the library. She has a fur coat over her arm. As the large room contains too many pieces of heavy furniture and the inside shutters exclude most of the light of day, she does not at once perceive George, She goes to the bay window: and glances out expectantly; then bends her attention upon buttoning a glove; after that she looks out toward the street again, ceases to whistle and turns toward the interior of the room. She comes to him, leans over from behind him and kisses his cheek. Dear, I waited lunch almost an hour for you, but you didn’t come! Did you lunch out somewhere? George doesn’t look up from the book. Did you have plenty to eat? Are you sure? Wouldn’t you like to have Maggie get you something now in the dining room? Or they could bring it to you here, if you think it would be cozier. A bell tinkles and she moves to the doorway into the hall. She interrupts herself to address Mary who is passing through the hall. I think it’s Mr. Morgan, Mary. Tell him I’ll be there at once. A few seconds pass and Mary returns. Another one? I ‘thought you said it was a peddler when the bell rang a little while ago. There seem to be a great many of them. What did yours want to sell, George? You must have cut him off short. (she laughs and then, still standing; in the doorway, notices the big silver frame) Gracious, Georgie! You have been investing! (she comes across the room for a closer view; then, half-timidly, half-archly) Is it – is it Lucy? But the next instant she sees whose likeness it is – and she is silent, except for a long, just-audible. George neither looks up nor moves. That was nice of you, Georgie. I ought to have had it framed myself, when I gave it to you. He says nothing and, standing beside him, she puts her hand gently on his shoulder, then as gently withdraws it and goes out of the room. After a time George rises and goes warily into the hall. INTERIOR – HALL AND RECEPTION ROQM –AMERSON MANSION – Day – (1905) George comes out of the library and, taking care to make no noise, obtains an oblique view of Isabel through the open double doors of the reception room. She is sitting in a chair looking out the window expectantly — a little troubled. He goes back to the library. INTTERIOR. HALL AND RECEPTION ROOM – AMBERSON MANSION – (1905) A half hour later George returns noiselessly to the same position in the hall where he can see Isabel. She is still sitting patiently by the window. INTERIOR. SECOND FLOOR RECEPTION ROOM – AMBERSON MANSION – DAY (1905) The door of George’s room is open. As we hear the sound of the front doorbell, George comes out of his room and crosses to the stairs. INTERIOR – STAIRCASE AND LOWER FLOOR – AMBERSON MANSION – DAY – (1905) REVERSE ANGLE – SHOOTING down the stairs to hall below. George enters, goes halfway down the stairs and stands in foreground of shot to listen. Mary appears in the hall below him, but after a glance toward the front of the house she turns back and withdraws. Isabel has evidently gone to the door. A murmur is heard. I want to talk to you, Isabel. The sound of vehement sniffling breaks out just ·above George. He looks up past camera. ANGLE LOOKING UP stairway past George. He sees Fanny on the landing, leanings over the bannisters and applying her handkerchief to her eyes. I can guess what that was about. He’s just told her what you did to Eugene! You go on back to you room! He begins to descend the stairs, but Fanny rushes down and catches his arm, detaining him. No, you don’t, Georgie Minafer! You keep away from there! I won’t! You come back here! And let them alone! She clutches and tugs at him with determination; and though George tries to wrench away, nevertheless she forces him, stumbling to the landing. Fanny takes one hand from its grasp of his sleeve and claps it over his mouth. Hush up! Hush up! It’s indecent — like squabbling outside the door of an operating room! Go on to the top of the stairs –- go on! George unwillingly obeys and Fanny plants herself in his way on the top step. I suppose you think I haven’t! I thought you already knew everything I did! I was just suffering so I wanted to let out a little — Oh, I was a fool, Eugene never would have looked at me even if he’d never seen Isabel. And they haven’t done any arm. She made Wilbur happy, and she was a true wife to him as long as he lived. And here I go, not doing; myself a bit of good by it, and just…(Wrings her hands again)...just ruining them. Sh! (she checks him, laying her hand on his arm). Your uncle’s leaving. The library doors are heard opening and a moment later there comes the sound of the front door closing. George moves toward the head of the stairs, and stands listening, but the house is silent. Fanny makes a slight noise with her lips to attract his attention and when he glances toward her she shakes her head at him urgently. Let her alone. She’s down there by herself. Don’t go down. Let her alone. She moves a few steps toward him and halts, her face pallid and awestruck, and then both stand listening. No sound comes to them. Fanny breaks the long silence with a stifled gasp and retires softly to her room. After she is gone, George looks about him bleakly, then on tiptoe crosses the hall and goes into his own room. Still tiptoeing George goes across the room and sits down heavily in a chair facing the window. Outside there is nothing but the darkening air and the wall of the nearest of the new houses. George’s gaze at the grayness beyond the window is wide-eyed and bitter. Darkness has closed in when there is a step in the room behind him. Isabel kneels beside the chair, her two arms go round him with infinite compassion; her gentle head rests against his shoulder. You mustn’t be troubled, darling. INTERIOR – LITTLE OUTSIDE PARLOR – MORGAN HOME – NIGHT – (1905) Jack, looking sad and uncomfortable, his overcoat on, his hat in his lap, is sitting, waiting. CAMERA PANS around a wall into an adjoining room where Eugene is seen sitting at a desk writing a letter. He lifts the pen from the paper, and looks down at what he has just written. CLOSEUP – Eugene looking down at the letter before him. He starts to write again, and on sound track we hear the scratching, of his pen, and his voice speaking the words he is writing, but his lips do not move. Dearest one, yesterday I thought the time had come when I could ask you to marry me, and you were dear enough to tell me “some time it might come to that.” But now we’re faced not with slander and not with our own fear of it, because we haven’t any, but someone else’s fear of it — your son’s. And, oh, dearest woman in the world, I know what your son is to you, and it frightens me! Let me explain a little: I don’t think he’ll change — at twenty-one or twenty-two so many things appear solid and permanent and terrible which forty sees are nothing but disappearing miasma. Forty can’t tell twenty about this; twenty can find out only by getting to be forty. And so we come to this, dear: Will you live your own life your way, or George’s way? Dear, it breaks my heart for you, but what you have to oppose now is the history of your own selfless and perfect motherhood. Are you strong enough, Isabel? Can you make the fight? I promise you that if you will take heart for it, you will find so quickly that it has all amounted to nothing. You shall have happiness, and only happiness. I am saving too much for wisdom, I fear. But oh, my dear, won’t you be strong — such a little short strength it would need! Don’t strike my life down twice, dear — this time I’ve not deserved it. INTERIOR – GEORGE’S BEDROOM – AMBERSON MANSION – NIGHT -(1905) George, wearing his long black velvet dressing gown, has just finished reading Eugene’s letter. Isabel is standing at the other end of the room, her back to him, her head drooping a little. George tosses the letter abruptly from him so that one sheet falls upon his bed and the others upon the floor. At the faint noise of their falling, Isabel comes and, kneeling, begins to gather them up. Did you read it, dear? Certainly! It’s simply the most offensive piece of writing that I’ve ever held in my hands! Isabel steps back from him, startled. I can’t understand your even showing me such a thing! How did you happen to bring it to me? Yes, I should like to hear what they thought! They thought it would be the most straightforward thing. Well, what do you think mother? I thought it would be the simplest and most straightforward thing; I thought they were right. Very well! We’ll agree it was simple and straightforward. Now what do you think of that letter itself? Don’t you think this was a pretty insulting letter for that man to be asking you to hand your son? Oh, no! You can see how fair he means to be. Do you suppose it ever occurs to him that I’m doing my simple duty? That I’m doing what my father would do if he were alive? That I’m doing what my father would ask me to do if he could speak from his grave out yonder? Do you suppose it ever occurs to that man for one minute that I’m protecting my mother? He raises his voice, advancing upon Isabel fiercely. Isabel bends her head before him. He’s got my mother’s name bandied up and down the streets of this town till I can’t step in those streets without wondering what every soul I meet is thinking of me and of my family, and now he wants you to marry him so that every gossip in town will say, “There! What did I tell you? I guess that proves it’s true! He said he and you don’t care what they say, but I know better! He may not care — probably he’s that kind — but you do. Is it fair of him to want you to throw away your good name just to please him? That’s all he asks of you — and to quit being my mother! You’re my mother and you’re an Amberson — and I believe you’re too proud! You’re too proud to care for a man who could write such a letter as that! (he stops, faces her, and speaks with more self-control) Well, what are you going to do about it, Mother? What answer are you going to make to such a letter? I — I don’t quite know, dear. Do you think if you did what he wants you to I could bear to stay another day in this town, Mother? Do you think I could ever bear even to see you again if you married him? I’d want to, but you surely know I just-­couldn’t! Isabel makes a futile gesture, and seems to breathe with difficulty. Mother! Do you think you could go on seeing him after this! Isabel had been talking helplessly before — her tone is a little more broken now. Not — not even — see him? How could you? Mother, it seems to me that if he ever set foot in this house again – oh! I can’t speak of it! Could you see him, knowing what talk it makes every time he turns into this street, and knowing what that means to me! Oh, I don’t understand all this — I don’t! If you’d told me, a year ago, that such things were going to happen, I’d have thought you were insane — and now I believe I am! His anguish is none the less real for its vehemence; and the stricken Isabel comes to him instantly and bends over him, once more enfolding him in her arms. She says nothing but suddenly her tears fall upon his head. She sees them and seems to be startled. Oh, this won’t do! I’ve never let you see me cry before, except when your father died. I mustn’t! She runs from the room. A little while after she has gone, George rises and, happening to catch sight in his pier glass of the picturesque and medieval figure thus presented in his dressing gown, he pauses to regard it; something profoundly theatrical in his nature comes to the surface· His lips move. Tis not a lone my inky cloak, good Mother, Nor customary suits of solemn black. . .
His own mirrored princely image with hair disheveled on the white brow, the long tragic fall of black velvet from the shoulders, reminds him of that other gentle prince and heir whose widowed mother was minded to marry again. He looks and feels like Hamlet. INTERIOR – ISABEL’S ROOM – AMBERSON MANSION – NIGHT (1905) CLOSE SHOT of Isabel at her writing table. The scratching of her pen is heard and over it on sound track, her voice speaks the words she is writing, but her lips do not move. George, walking up National Avenue, sees Lucy coming toward him on the same side of the street. For a moment he thinks of facing about in flight. He expects her to rebuff him. But Lucy comes straight to meet him, smiling, her hand offered to him. Why — you – haven’t you–? He sees Eugene hasn’t told her. Nothing. May ‘I — May I walk with you a little way? They start walking down the street. Lucy, I want to tell you something. I hope it’s something nice. (laughs) Papa’s been so glum today he’s scarcely spoken to me. Is it a funny story? I just trotted off for some visits. Why, no. Don’t you remember, George? We had a quarrel and we didn’t speak to each other all the way home from a long, long drive! And since we couldn’t play together like good children, of course it was plain that we oughtn’t to play at all. At being lovers, you mean, don’t you? Something like that. It was absurd! It didn’t have to be absurd. No, it couldn’t help but be! The way I am and the way you are, it wouldn’t ever be anything else. This time I’m going away. That’s what I wanted to tell you. I’m going away tomorrow night — indefli1itely. I hope you’ll have ever so nice a time, George. I don’t expect to have a particularly “nice” time. Well, then, if I were you I don’t think I’d go. It seems impossible to make her serious. This is our last walk together. Evidently! If you’re going away tomorrow night. Lucy — this may be the last time I’ll see you ever — ever in my life . At this she looks at him quickly, across her shoulder, but she smiles as brightly as before. Mother and I are starting tomorrow for a trip around the world. We’ve made no plans at all — for coming back. He halts and she stops with him. They have come to a corner at the edge of the business section of the city and people are everywhere about them, brushing against them, sometimes, in passing. I can’t stand this. I’m just about ready to go in this drug store here and ask the clerk for something to keep me from dying in my tracks! It’s quite a shock, Lucy. To find out just how deeply you’ve cared for me! To see how much difference this makes to you. I can’t stand this any longer. I can’t! Good-bye, Lucy. It’s good-by. I think it’s good-bye for good, Lucy! Good-bye! I do hope you’ll have the most splendid trip. Give my love to your mother. CAMRA PULLS back ahead of him, holding Lucy in back ground. A moment later he pauses, glances back at her over his shoulder. She stands watching him, the same smile on her face. She waves cheerily. George strides savagely onward, not looking back. Lucy remains where she is until he is out of sight. Then she goes slowly into the drug store. Lucy walks up to the clerk. Please let me have a few drops of aromatic spirits of ammonia in a glass of water. CAMERA STAYS on him as he turns to the shelves to get the spirits of ammonia. When he turns back with the bottle in his hand, his expression changes to one of astonishment, and he makes a quick move toward the counter. The drug store clerk is telling his friends what happened. …an’ ‘f I hadn’t been a bright, quick, ready-for-anything young fella she’d a’ flummixed plum! I was watchin her out the window – talkin’ to some young s’iety fella, and she was all right then. She was all right when she came in the store, too. Yes, sir; the prettiest girl that over walked in our place and took one good look at me. I reckon it must be the truth what some a’ you town wags say about my face! The five new houses, built so close to where the Mansion’s fine lawn had been — a sad panorama. Before this is a steady stream of passing automobiles, with now and then a bicycle, or, at long intervals, a surrey or buggy. REVERSE ANGLE toward the Mansion, where Major Amberson and Fanny are dimly seen, seated on the verandah. CLOSE ANGLE on Major Amberson and Aunt Fanny seated on the verandah. The Major is looking toward the houses. Housekeeping in a house is harder than in an apartment. How did you manage such an economy? I said it was a painful satisfaction, Fanny. The property has gone down in value, and they assessed it lower than they did fifteen years ago. Oh, Yes, “farther out!” Prices are magnificent “farther out” and farther in, too! We just happen to be in the wrong spot, that’s all. He sighs; and both are silent, looking out at the constantly passing traffic. There seem to be so many ways of making money nowadays. Jack had some scheme he was working on before he went abroad. Yes — that invention. “Millions in it!” Some new electric headlight. He’s putting half he’s laid by into it. Had a letter from him the other day asking me to go into it, too. He seemed certain it would pay twenty-five percent the first year, enormously more after that; and I’m only getting four on my little principal. Again both are silent, watching the passing traffic. Isabel wants to come home. Her letters are full of it. Jack writes me she talks of nothing else. People are making such enormous fortunes out of everything to do with motor cars, it does seem as if — I wrote Jack I’d think it over seriously. Well, Fanny, maybe we’ll be partners. How about it? And millionaires, too! The Morgan mansion is a great Georgian picture in brick with four acres of its own hedged land between it and its next neighbor. A car appears, driven by a chauffeur, with Lucy and Jack inside. It turns in between the stone and brick gate pillars and starts up the driveway. SHOT of Lucy and Jack in the car. I wonder, Lucy, if history’s going on forever repeating itself. I wonder if this town’s going on building up things and rolling over them, as poor father once said it was rolling over his poor old heart. It looks like it. The car comes to a stop at the house. Lucy, and Jack get out and go up the stairs. Here’s the Amberson Mansion again, only it’s Georgian instead of nondescript Romanesque; but it’s just the same Amberson Mansion my father built long before you were born. INTERIOR. HALL & LOWER FLOOR ROOMS – MORGAN MANSION – (1910) Lucy and Uncle Jack come in. A butler relieves his hat and coat. By Jove! You have been going it! Fanny tells me you had a great house-warming dance, and you keep right on being the belle of the ball, not any softer-hearted than you used to be. Fred Kinney’s father says you refused Fred so often he got engaged to Janie Sharon just to prove that someone would have him in spite of his hair. Lucy laughs, a little embarrassed. Jack has moved to a window. Well, you’re pretty refreshingly out of the smoke up here. Yes, for a while. Until it comes and we have to move out farther. A grey and shadowy room. Lucy, Jack and Eugene are having after-dinner coffee. Jack’s attention for a moment is occupied with a cigars, then he speaks in a casual tone of Isabel and George. I found Isabel as we11 as usual, only I’m afraid “as usual” isn’t particularly well. It struck me Isabel ought to be in a wheel-hair. He pauses, bestowing minute care upon the removal of the little band from his cigar. Eugene speaks out of the shadow beyond a heavily shaded lamp. Oh, she’s cheerful enough. At least, she manages to seem so. But she’s pretty short of breath for such a slender person. Father’s been that way for years, of course; but never nearly so much as Isabel is now. I told her I thought she ought to make George let her come home. “Let her?” Does she want to? She doesn’t urge it. George seems to like the life there in his grand, gloomy, and peculiar way; and of course she’ll never change about being proud of him and all that — he’s quite a swell. But she does want to come. She’d like to be with father, of course; and I think she’s — well, she intimated one day that she was afraid it might even happen that she wouldn’t get to see him again. (he can hardly say it) I think she was really thinking of her own state of health. I see. And you say he won’t “let” her come home? Oh, I don’t think he uses force! He’s very gentle with her. I doubt if the subject is mentioned between them, and yet — and yet, knowing my interesting nephew as you do, wouldn’t you think that was about the way to put it? Knowing him as I do – yes. Yes, I should think that was about the way to put it. Against a background of loud station noises, Jack and Fanny are standing beside a car platform with a wheel chair. George, carrying Isabel, appears and places Isabel in the chair. Isabel can’t speak, but she pats Fanny’s and Jack’s hands. They wheel Isabel to a waiting carriage. George lifts her into the carriage, they get in and the carriage pulls away. Isabel, George, Aunt Fanny, and Uncle Jack. Isabel seems a little stronger. She has been holding George’s hands and looking out the carriage window. Now she takes her hand from George and waves it feebly toward the window. You mean the town. You mean the old place is changed don’t you, dear? It’ll change to a happier place, old dear, now that you’re back in it, and going to get well again. Isabel looks at him wistfully, her eyes a little frightened. INTERIOR. SECOND FLOOR HALL – AMBERSON MANSION – NIGHT – (1910) At the end of the hall are Jack, George, and Major Amberson, clustered in a stricken group. When are they going to let me see my daughter? They told me to keep out of the way while they carried her in, because it might upset her. I wish they’d let me go in and speak to my daughter. I think she wants to see me. Jack moves off down the hall in the other direction. Fanny comes up to George. Eugene is here. (after another moment) George. (still whispering) Eugene is here. George looks at her sharply. The doctor said we “must keep her peaceful.” Do you think that man’s coming would be very soothing? Why, it would be like taking a stranger into her room. Doesn’t he know how sick she is? You tell him the doctor said she had to be quiet and peaceful. That’s what he did say, isn’t it? Fanny goes. George watches her go down the stairs. INTERIOR – RECEPTION ROOM – AMBERSON MANSION – NIGHT – (1910) Eugene seated. He rises as he sees Fanny coming toward him. She enters. He starts toward her and then is stopped by something he sees in her face. The doctor says she ought to be kept quiet. INTERIOR – SECOND FLOOR HALL – AMBERSON MAUSION – NIGHT – (1910) George is standing at the window, looking out. SHOOTING over George’s shoulder — through the window ­ as he watches Eugene walk to his car. George wheels, his mouth opens in terror. INTERIOR. SECOND FLOOR HALL – AMBERSON MANSION – NIGHT – (1910) George’s terrified mouth shuts with a click and he nods and follows the nurse. She stays outside while he goes into Isabel’s room. INTERIOR. ISABEL’S ROOM – AMBERSON MANSION – NIGHT – (1910) Isabel’s eyes are closed, and she does not open them or move her head, but smiles and edges her hand toward George as he comes to her bed and sits on a stool. He takes her hand and puts it to his cheek. Darling, did you — get something to eat? Are you sure you didn’t — didn’t catch cold– coming home? To feel — my hand on your cheek. I — I can feel it. I wonder if — if Eugene and Lucy know that we’ve come -­ home. Has he asked about me? I’d like to have — seen him. (Pause) Just — Just once. Isabel is still, as though asleep, but when George moves to go, a faint pressure on his fingers detains him and he stays, her hand still pressed against his cheek. After a while he moves again, to let the nurse come in, and this time there is no pressure of fingers. After he has left, Isabel opens her eyes and looks after him. INTERIOR -GEORGE’S ROOM – AMBERSON MANSION – NIGHT – (1910) As George enters his room he is startled to find the Major and Jack there. The Major is lying on the bed dozing uneasily, even occasionally snoring. Jack is leaning against the wall. George sits on the edge of the bed. From time to time he wipes heavy sweat from his forehead. The Major snores, stops suddenly and moves as if to rise, but Jack puts his hand on the Major’s shoulder to reassure. That doctor in New York said she might got better. Don’t you know he did? Don’t you know he said she might? Jack doesn’t answer. Suddenly there is a sound in the hall and both men start violently – the Major sits up in bed. They hear the nurse speaking to Fanny and then Fanny appears in the doorway making contorted efforts to speak. Jack goes out with the Major. Fanny utters a long loud cry, throws her arms around George and sobs in agony of loss and compassion. She loved you! She loved you! She loved you Oh, how she did love you! The Minafer plot. Beside Wilbur’s grave now is Isabel’s, his headstone aged with the weather — Isabel’s headstone bright and new, with the words: ISABEL AMBERSON MINAFER and the date. Her grave is heaped with flowers, and some have been laid on Wilbur’s grave also. But it must go right! We saw with our own eyes how perfectly it worked in the shop. I’m only glad you didn’t go into the confounded thing to the extent I did. It certainly was a perfect thing — in the shop! Our headlight just won’t work, Fanny — Father – Father! The Major’s eyes brighten a little. The house was in Isabel’s name, wasn’t it? Can you remember when you gave her the deed, Father? No — no, I can’t just remember. The whole estate is about as mixed up as an estate can get, and I haven’t helped out any by this infernal headlight scheme. You ought to have that deed, George. Suddenly the Major slaps his knee as if he has made a discovery or remembers something he has forgotten. He moves his hand uncertainly as if reaching for something. Did you want anything, Grandfather? No –- no — no — I don’t want anything. I wish — somebody could tell me! The Amberson plot. The Major’s grave, with its new headstone and mound of flowers. George is staring down at Fanny who has just sunk to the floor, her back resting against the hot water boiler. The kitchen has been dismantled. There is a pot of coffee on the stove and some glasses and broken dishes on otherwise empty shelves. You’re going to leave me in the lurch! I can’t. I’m too weak. You’re going to leave me in the lurch! Aunt Fanny! I’m only going to get eight dollars a week at the law office. You’d have to be paying more of the expenses than I would. She stares at him with forlorn blankness. I’ve got twenty-eight dollars. That’s all. You mean until the interest is due again? I mean that’s all. I mean that’s all there is. There won’t be any more interest because there isn’t any principal. I know. I told Jack I didn’t put everything in the headlight. But I did — every cent except my last interest payment — and it’s gone. Why did you wait till now to tell me? It’s not hot. It’s cold. The plumbers disconnected it. I wouldn’t mind if they hadn’t. I wouldn’t mind if it burned me, George. For gosh sake, get up! He lifts her to her feet and leads her to the dining room. This room has also been dismantled and contains only two kitchen chairs and a rough table. George leads Fanny in from the kitchen and seats her in one of the chairs. He exits to the kitchen and returns with the coffee pot, some lumps of sugar in a tin pan, and a couple of water glasses. He pours some of the pale coffee into the glasses. I’m sure the boarding house is practical, George — and it is a comfort to be among nice -­ people. There’s one great economy. They don’t allow any tipping. They have signs that prohibit it. Oh, longer! So you see. It is early and Bronson, who has just seated himself at his big, flat-topped desk, is surprised when George walks in. He is also pleased and rises, offering a cordial hand. I can’t do it! I can’t take her for my mistress. I’ve come to tell you I’ve got to find something quicker. Something else that pays from the start. I can’t think of anything just at this minute that pays from the start. I’ve heard they pay very high wages to people in dangerous trades; people that handle touchy chemicals or high explosives — men in dynamite factories. I thought I’d see if I couldn’t get a job like that — as soon as possible. I wanted to get started tomorrow if I could. Georgie, your grandfather and I were boys together. Don’t you think I ought to know what’s the trouble? It’s Aunt Fanny. She’s set her mind on this particular boarding house and — it seems she put everything in the headlight company — and — well — she’s got some old cronies there, and I guess she’s been looking forward to the games of bridge and the kind of harmless gossip that goes on in such places. Really, it’s a life she’d like better than anything else — and it struck me she’s just about got to have it. I’m taking the responsibility. (smiles with one corner of his mouth) She’s not your aunt, you know, sir. Well, I’m unable to see, even if she’s yours that a young man is morally called upon to give up a career at the law to provide his aunt with a favorable opportunity to play bridge whist! George looks at him. Bronson returns a long stare. Jack and George are sitting together on one of the waiting benches. Jack’s valise is on the floor beside him. …Just a hundred, George. I know you can’t spare it, but I really must have something to tide me over in Washington till things are settled. George has already taken out his wallet. He looks around uncertainly. George hands him the money. Jack puts it away and starts to laugh, but now with great cheerfulness. I wish you’d take more. One thing I’ll say for you, young George; you haven’t a stingy bone in your body. That’s the Amberson stock in you. (puts his hand on George’s shoulder; his voice a little husky) I — ah — may not see you again, Georgie — it’s quite probable that from this time on we’ll only know each other by letter — until you’re notified as my next of kin that there’s an old valise to be forwarded to you, and perhaps some dusty curios from the consulate mantelpiece. Well, it’s an odd way for us to be saying good-bye; one wouldn’t have thought it, even a few years ago, but here we are, two gentlemen of elegant appearance in a state of bustitude. We can’t ever tell what will happen at all, can we? Once I stood where we’re standing now, to say good-bye to a pretty girl — only it was in the old station before this was built and we called it the “depot.” We knew we wouldn’t see each other again for almost a year. I thought I couldn’t live through it — and she stood there, crying. Well, I don’t even know where she lives now, or if she is living — and I only want to think of her sometimes when I’m here at the station waiting for a train. If she ever thinks of me she probably imagines I’m still dancing in the ballroom at the Amberson Mansion, and she probably thinks of the Mansion as still beautiful — still the finest house in town. Life and money both behave like loose quicksilver in a nest of cracks. And when they’re gone we can’t tell where — or what the devil we did with ‘em! But I believe I’ll say now — while there isn’t much time left for either of us to get embarrassed about it — I believe I’ll say that I’ve always been fond of you, Georgie, but I can’t say that I always liked you. We all spoiled you terribly when you were a boy. But you’ve got a pretty heavy jolt — and you’ve taken it pretty quietly and -­ well, with the train coming into the shed, you’ll forgive me for saying that there have been times when I thought you ought to be hanged — but I’ve always been fond of you, and now I like you; and just for a last-word: there may be somebody else in this town who’s always felt about you like that — fond of you, I mean, no matter how much it seemed you ought to be hanged. You might try – Hello, I must run. He grabs his valise and jumps up. I’ll send back the money as fast as they pay me — so good-bye and God bless you, Georgie! He rushes off to catch the train and is lost from sight in the hurrying crowd. George is walking slowly up the street away from camera. CAMERA FOLLOWS, MOVING FASTER than he does until it is so close that his body creates a dark screen for a DISSOLVE. George Amberson Minafer walked homeward slowly through what seemed to be the strange streets of a strange city; for the town was growing and changing as it never had grown and changed before. It was heaving up in the middle incredibly; it was spreading incredibly; and as it heaved and spread, it befouled itself and darkened its sky. In this alley he’d fought with two boys at the same time, and whipped them. On that sagging porch a laughing woman had fed him and other boys with doughnuts and gingerbread. Yonder the relics of the iron picket fence he’d made his white pony jump, on a dare. And in the shabby stone-faced house behind the fence he’d gone to children’s parties — and when he was a little older he’d danced there often and fallen in love with Mary Sharon and kissed her, apparently by force, under the stairs in the hall. CAMERA IS MOVING up National Avenue to Amberson Addition. It stops at the intersection. CLOSEUP of the street sign. The arm of it now bears the name “lOth Street” where the name “Amberson Boulevard used to be. One sees so many nice-looking people one doesn’t know nowadays. CAMERA PANS across to the car — a red one, glittering in brass, with half’ a dozen young people in it whose motorism has reached an extreme manifestation in dress. The ladies of this party are looking favorably at the camera. This old town of ours is really getting enormous. I shouldn’t mind knowing who he is. I don’t know. I don’t know who he is, but from his looks I know who he thinks he is: he thinks he’s the Grand Duke Cuthbert! SHOT of George, from ANGLE of the people in the car. The driver of the car is heard throwing it into gear. The CAMERA PULLS AWAY SLOWLY, then FASTER (as though it is the car), leaving George. The city had rolled over his heart and buried it under, as it rolled over the Major’s and the Ambersons and buried them under to the last vestige. Tonight would be the last night that he and Fanny were to spend in the house which the Major had forgotten to deed to Isabel. Tomorrow they were to move out. On the Narrator’s words “move out” the door opens and CAMERA MOVES thru it into the house. MOVING SHOT as CAMERA WANDERS SLOWLY about the dismantled house — past the bare reception room; the dining room which contains only a kitchen table and two kitchen chairs; up the stairs, close to the smooth walnut railing of the balustrade. Here CAMERA STOPS for a moment, then PANS down to the heavy doors which mask the dark, empty library, HOLD on this for a short pause, then CAMERA PANS back and CONTINUES, even more slowly, up the stairs to the second floor hall where it MOVES up to the closed door of Isabel’s room. The door swings open and we see Isabel’s room is still as it always has been; nothing has been changed. — Mother, forgive me! God forgive me! SHOT of the Amberson Mansion — massive as the old house is, it manages to look gaunt: its windows stare with the skull emptiness of all windows in empty houses that are to be lived in no more. Of course, the rowdy boys of the neighborhood have been at work; many of these haggard windows are broken; the front door stands ajar, forced open; and idiot salacity, in white chalk, is smeared everywhere upon the pillars and stone-work of the veranda. Lucy and Eugene are walking in their garden. Did you ever hear the Indian name for that little grove of beech trees? No — and you never did either! Vendonah was unspeakable. He was so proud that he wore iron shoes and he walked over people’s faces with them. He was always killing people that way, and so at the last the tribe decided that it wasn’t a good enough excuse for him that he was young and inexperienced –- he’d have to go. They took him down to the river and put him in a canoe, and pushed him out from shore; and the current carried the canoe out into the middle and then on down to the ocean, and he never got back. They didn’t want him back, of course. But still they didn’t elect another chief in his place. They hated Vendonah but they weren’t able to discover any other warrior they wanted to make chief in his place. They couldn’t help feeling that way. I suppose I’m like the tribe that lived here, Papa. I had too much unpleasant excitement. It was unpleasant — but it was excitement. I don’t want any more; in fact, I don’t want anything but you. He looks at her keenly and she laughs and shakes her head; but he seems perplexed, rather doubtful. What was the name of the grove? The Indian name, I mean. I see you have. Perhaps you remember the chief’s name better. I hope someday you can forget it. As the scene is DISSOLVING in, an ambulance is swinging around the corner and coming to a stop. It backs around a big crowd of people. Attendants take a stretcher from the back of it, disappear with it behind the crowd for a few moments, and then reappear and return the stretcher to the ambulance with a body on it. During this a smallish young man in a duster fidgets among the crowd, explaining and protesting. Simultaneously with this, a policeman is talking to a fellow patrolman who has joined him. The policeman dominates the scene. Funny what he says to the little cuss that done the damage. That’s all he did call him -­ nothing else at all -­ an’ the cuss had broke both his legs for him and gosh-knows-what-all! You bet your life they ain’t no case on me! I’m sorry fer him, all right, but it wasn’t anymore my fault than the statehouse! Ho run into me, much as I run into him, and if he gets well he ain’t goin’ to get not one single cent out o’ me! I’m perfectly willin’ to say I’m sorry for him, though, an’ so’s the lady with me. We’re both willin to say that much, but that’s all understand? During the above, the ambulance clangs away and the crowd disperses. I wasn’t here then. What was it? Eugene, with his hat on the back of his head and one arm through the sleeve of his overcoat, is looking down at the paper. He sticks the other arm into the coat, picks up the newspaper and puts it in his pocket. EXTERIOR. STREET OUTSIDE MORGAN AUTOMOBILE PLANT – DUSK (1912) CLOSE SHOT at Eugene’s car, ANGLING past the chauffeur in driver’s seat, toward back of the car. Eugene, the newspaper in his pocket, steps quickly into the car and pulls the door closed behind him. I won’t go home now, Harry. Drive to the City Hospital. Yes, sir. Miss Lucy’s there. She said she expected you’d come there before you went home. I suppose Mr. Minafer must be pretty bad. Harry puts the car in gear and drives off. Eugene’s car drives up and stops. Eugene gets out and goes into the hospital. Eugene’s car waiting. Eugene comes out of the hospital, sadly and quietly, and gets in the car. The car pulls up to the door. Eugene gets out. Good night, sir Mr. Morgan. Eugene comes into the library, goes to his secretary and takes out his diary, unlocks the clasp with a tiny key on his watch chain, opens it, picks up a pen and starts to write. CLOSEUP of Eugene as be writes. We hear only the scratching of his pen, and on the sound track his voice. Dearest Isabel — your boy was hurt in a street accident today — run down by an automobile. I thought at first I wouldn’t go to see him at the hospital, but of course I did. I thought it would be hard not to be bitter but I found it was easy — he looked so much like you, dearest one. As I came in, he lifted his hand in a queer gesture, half-forbidding, half­ imploring, then let his fall back on the covers. He said, “You must have thought my mother wanted you to come so that I could ask you to — to forgive me.” Lucy was beside him and she shook her head. No she said, “just to take his hand — gently.” She was radiant. But for me another radiance filled the room — and I knew I’d been true at last to my true love and that through me you had brought your boy under shelter again. .